Is It Your Thyroid? Thyroid Awareness Month. January is thyroid awareness month. Despite the fact that I’ve been taking daily thyroid supplements for almost thirty years, I was not aware of awareness month. Even worse, like 60% of people who suffer from thyroid issues, I spent years not even being aware that I had an untreated thyroid condition. So, this Thyroid Awareness Month, I encourage you to be aware of thyroid symptoms all year-long, because although thyroid conditions are common (12% of the US population will develop one,) the health implications of having being hyperthyroid (overactive) or hypothyroid (under active) can impact every part of your body and every part of your life. Before you jump into “Taking 2,” take 1 second and notice how you’re standing or sitting. My guess is that you’re not sitting in a perfectly aligned, yoga like position and instead your head is jutting forward over a phone or keyboard, putting 10 pounds (YES 10 POUNDS) of pressure on your poor neck. We shouldn’t be surprised when our backs and necks hurt, we should be surprised when they don’t! You only have one you – take care of it. For more daily micro-resolutions, visit my Dusting Off My Parachute Facebook Group. MEsearch Monday – It’s all about ME! The point is to take at least 1-2 hours a week to do something BY YOURSELF in an effort to learn more about yourself = MEsearch! Think of at as a date with yourself. Have fun planning it & anticipating it. Don’t use it to check something off your to-do list. This isn’t about being practical, it’s about making special time for yourself. Choose something that is outside the norm or your comfort zone. Don’t think you have to spend a lot of money. There are tons of free options. Use Mondays to brainstorm and research our MEsearch date for the week. Have lunch at a restaurant that serves a type of food you’ve never tried before. Try something you’ve had a million times a different way. Always have eggs scrambled? Try one poached this week! Go to one of those ‘drink wine while you paint’ classes. Attend a craft event at a local community center. Try a hot yoga class. Go to a film with subtitles. What are some things you’ve been wanting to try but have been hesitant to do? Get it on your calendar and leave your ideas here in case anyone else needs ideas. Get more daily micro-resolutions over at my Dusting Off My Parachute Group. For those who are new to the Dusting Off My Parachute Facebook Group, F-It Friday can have a wide range of goals. Some are of the more foul-mouthed, F-It variety, like when you finally decide that you are NEVER going to get around to super gluing the broken Christmas ornament that has been on your kitchen counter for three years. On F-It Friday, your mission is to say, “F-It”, toss it in the trash and make peace with the universe now that you don’t have to have a little porcelain tree staring at you as a reminder of every failure in your life every time you go to the kitchen to steal from your kids’ snack cabinet. Today, my F-It Friday felt SOOOOO GOOOOOD! Every morning, I make a bowl of oatmeal because Oprah told me to once, and because my cholesterol is the level of an 85 year old man. Every morning I dig through my measuring cup cabinet and spend 10x as long as necessary sorting through all of the cups to find my 1/2 cup. Sure, it only really wastes about 10 seconds of my life, but it wastes about 50% of my patience for the day. The other day, while doing my favorite thing in the world, (wandering aimlessly through the Costco office supply aisle,) I came across a jumbo pack of these 3M hook-y things that usually cost more than I’m willing to splurge on a measuring cup hanging project, for a total bargain. In under 5 minutes, I not only transformed my measuring cup cabinet, but I have transformed my daily breakfast ritual. Ahhhhhhh. What little task can you say F-It to today? Get more daily micro-resolutions at my Dusting Off My Parachute Facebook Group. Thank You for Saying Thank You! How many times a day do we remind our kids to say thank you to other parents, camp leaders, etc? Now, how many times a day do YOU properly say thank you to people? Not a quick, “thanks” as you’re walking off, looking in the other direction, but a look-in-their-eyes, “thank you” that makes the other person feel like they are truly appreciated. One of my best friends is amazing at this. She should come take your kids to the zoo for the day, clean your house and make you dinner and somehow thank YOU in a way that made you feel like you really did her a huge favor letting her do all those things for you. She makes saying “Thank you” an art form. So today, say “Thank you” (and “you’re welcome” for that matter) like you really mean it whenever the opportunity presents itself. Saying Thank You makes other people feel valued and makes you realize how many kind and helpful people there are in our lives every day. Thank you for helping make the world a more thankful place today. Get more daily Micro-Resolutions over at my “Dusting Off My Parachute” Facebook Group. 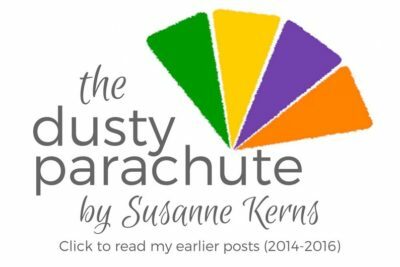 This is an excerpt from my Dusting Off My Parachute Facebook Group – Learn more here. This Wish ‘n Well Wednesday is brought to you by bed. Bed: the place my son is since the headache he went to bed with last night was still there this morning. I think my biggest luxury in life is that I have a schedule that permits me the flexibility to stay home with a sick, or even just potentially sick kid, when needed. It is not lost on me that probably the majority of moms don’t have the option to take the day off from work to tend to a sick kid or pay for childcare to have them stay home when they have sick-ish symptoms that may or may not be the real deal. And I wouldn’t mind a few “wishes” that his headache is the flu in disguise. Join my Facebook Group, Dusting Off My Parachute for daily prompts for totally doable mini-resolutions.